Even though the Apple Watch won’t be available until April 24, it is already being celebrated as a huge game changer. But what can wearables provide smartphones can’t? How can a simple watch revolutionize the way people travel? When Apple announced the release date for the Apple watch, many people around the world were either joyfully gasping for breath or shaking their heads in disbelief. The competition is fierce, yet the consumers don’t seem to be completely ready for the concept of an all-round watch. While the gadget merely serves as a small additional screen for the wearer’s smartphone, it still offers some interesting features for travelers. The Taptic Engine – Whenever you receive an alert or notification, the watch gently taps you on the wrist. This function applies to different apps and will tap you when it is time to board the plane or turn to the right (or left) while you are using the map. Citymapper – It recognizes your location and gives you step-by-step instructions on how to get to your destination using public transit. When you have reached your stop, your watch delivers a tap. Never be late again – When it is time to leave for the airport, you will receive a notification on your watch. The same goes for flight information (like gate changes and delays for example), connection details and baggage claim. During your flight, you can also see a map with the remaining time until arrival at your destination. Passbook – With Passbook, your boarding passes, tickets and loyalty cards are right on your wrist and ready to use. The watch also alerts (and taps) you when it is time to use them. Apple Pay – If you capture your debit or credit card information on your iPhone, you can use your watch to hold it near the reader and pay for goods. Time Zones – Especially business travelers know that different time zones can be confusing sometimes. The watch allows checking the time in different cities with one look, so you don’t accidentally call your new business partner in the middle of the night. Siri – For all the people who are not familiar with Siri: “She” is a built-in assistant which allows iPhone users to speak commands in order to operate the phone and apps. Siri will also be accessible through the watch and can e.g. be used to search for restaurants, gas stations and hotels. Starwood Hotels & Resorts, Marriott International – If you are going to reside here during your trip, you can easily unlock the door to your room with your Apple Watch. The app also allows you to check in, see reservation details or even get directions to your hotel when you are lost. Trip Advisor – To get instant information about restaurants and sights at your destination, you can use Trip Advisor. Expedia – Gates, terminals and times for flights are easily accessible through your watch. If you have booked a hotel, you will also be able to see check-in and check-out times, ratings, locations, addresses and phone numbers. Uber – The watch shows you available cars that are nearby, just like the app on your phone. If you request a car, you will be able to see a picture of the car and the driver on your watch. American Airlines, Air New Zealand and EasyJet – If you fly with one of those carriers, you can receive flight information, see local currency exchange rates and the weather at your destination. The EasyJet app also allows sharing your flight information via Twitter and Facebook. Babbel – Depending on your location, the app shows you words in a different language that might be useful. For example, if you are in Germany and at the airport, the app will show you words such as “luggage” or “departure” and other ones that you might need. 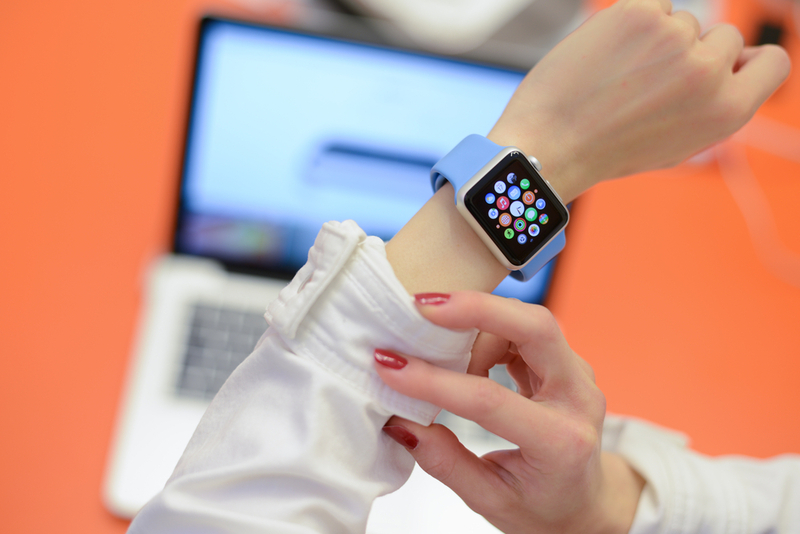 Battery Life – The battery of the Apple watch only lasts up to 18 hours. If you need to charge your watch during a flight you won’t be able to use the above mentioned apps to stay updated. If the watch dies on you while you are trying to get the directions to your hotel, you might be lost for a while. If you have to charge your watch at night, you will not be able to monitor your sleep – another feature of the watch. And sometimes chargers are not easily available on long trips. No GPS – The watch itself is not equipped with GPS, which means that every navigation app will eventually need the iPhone to be working. But what happens when you have low battery on your phone? More devices – Many travelers don’t just take 1-2 phones with them (personal and business), but also their laptop, camera, noise cancelling headphones, electric toothbrushes and chargers. Even though the watch is small, it is still another device that comes with a charger and needs to be taken care of. Pricey – For some people the watch may be pricey, for some not. But besides that, is the watch worth the money when many of the features are easily available through your phone anyway? Cooperation – What if you haven’t booked your flight through Expedia, are not staying at a Starwood Hotel or not flying with American Airlines? Many features can become useless if you don’t book at “the right place”. While leisure travelers have the choice, many business travelers have to book within the company’s guidelines and are less flexible. Collection of data – The watch comes with many features, but also collects sensitive personal health data. If the watch will be a success, companies will sooner or later have to face the task of integrating smartwatches into their IT which raises questions about privacy policies and BYOD. Having the advantages and disadvantages for travelers in front of you, do you think the Apple Watch will be successful? If so/if not, why? Personally, I don’t think that the watch brings significant advantages. It is just another device that you need to carry and operate. As for myself, I don’t wear watches anymore since I can always check the time on my iPhone or laptop and I’m simply not used to having something around my wrist. However, the health related features are quite interesting and useful, but is it really worth the money when there are way cheaper and lighter options on the market for this? 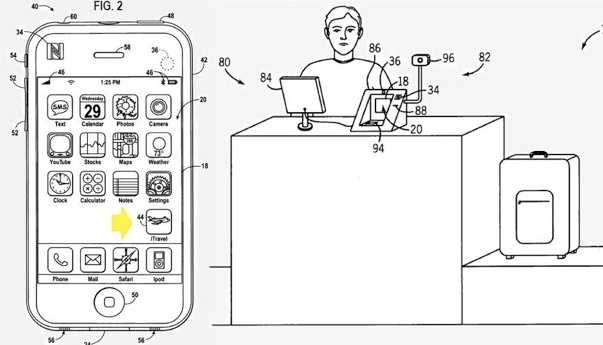 In 2009, Apple applied for a patent in regards to its iTravel application which was granted in 2012. When I published Value Creation in Travel Distribution, I already knew that RFID (radio frequency identification) would become widespread available. Just some clarification: The term is usually linked to NFC (near-field communication), but while RFID uses radio waves and is the process by which items are uniquely identified, NFC is a subset within this technology and responsible for secure data exchange like contactless payment. To understand why the watch might still need a few years to wow travelers, let us have a closer look at Apple Pay (NFC). It is considered easy and secure, since you can pay in thousands of stores by just placing your finger on the touch ID sensor. My brother in law – an IT guru – loves it, mainly due to its increased security. He tries to talk to every store owner who does not yet offer Apple Pay – I feel like he should be on Apple’s payroll. The app does not use your actual credit or debit card numbers, but a unique Device Account Number which is encrypted. Your identity and real card number are therefore never visible to anyone. This is basically the concept for paperless tickets, too: Allowing travelers to check in and board safely. And all this without any touching and thus spread of germs. However, airlines still need to be equipped with the right technologies to make a seamless boarding experience possible. Many people regularly experience problems with the Passbook App and the TSA readers at the airport. Since you can store your credit and debit card information in the app, it often prevents the readers from seeing the boarding pass, demanding to make a purchase. QR (quick response) code-based boarding passes are not uncommon, but within the next few years NFC will take hold and become the norm. The iPhone and Apple Watch are already NFC-enabled, but yet only another way to use QR boarding, given that the readers recognize the code. Once you can tap your way around the airport without experiencing problems, which should happen in the near future, we can talk about the advantages of the Apple Watch again. Since various producers of gate scanners have already implemented the NFC compatibility, it will only be a matter of time before they will be called into action. Let’s see how Beacon fits into the game and makes airport navigation even more seamless. Taking the health features aside, most of the great features – especially those for travel – do not really require the watch and the phone alone would be sufficient. Making a product nobody really needs, suitable for the mass with prices of $349 up to $1,099 and more, depending on case size and band style, is probably something only Apple can do. Microsoft’s smartwatch is only useful for its health features, but has not been able to convince consumers. Many other models have failed in their attempt to copy Apple’s concept. Only days after Apple announced the release of its watch, Google came into play and introduced its upcoming device: A smartwatch in cooperation with the luxury Swiss watchmaker TAG Heuer. The same old economic competition – but does the Apple Watch still have more potential than other smartwatches? Tim Cook is full of confidence and announced that his product will change the world of work. A realistic outlook on the future or an error of judgement? If we have a look at the past, there has always been some kind of initial ignorance of new technologies, don’t you think? The first laptops using the flip form factor appeared in the early 1980s and people were skeptical since they didn’t really know what they can do. They already had “real computers” and didn’t understand what the hype was about. Today, many years later, you are probably reading this article on your laptop, tablet or smartphone, aren’t you? Maybe it is going to be the same with the Apple Watch. Right now many people simply have no clue about what it really is, how it works and what it can provide for them since it is a recent development. But maybe, many years from now, the smartwatch will just be another mainstream product – and you will be reading my articles directly from your wrist.